Adapting To A More Extreme Climate, Coastal Cities Get Creative In preparation for sea level rise, vulnerable cities are building infrastructure to protect themselves. But as a look at New Orleans and Philadelphia shows, the strategies are unique to each city. 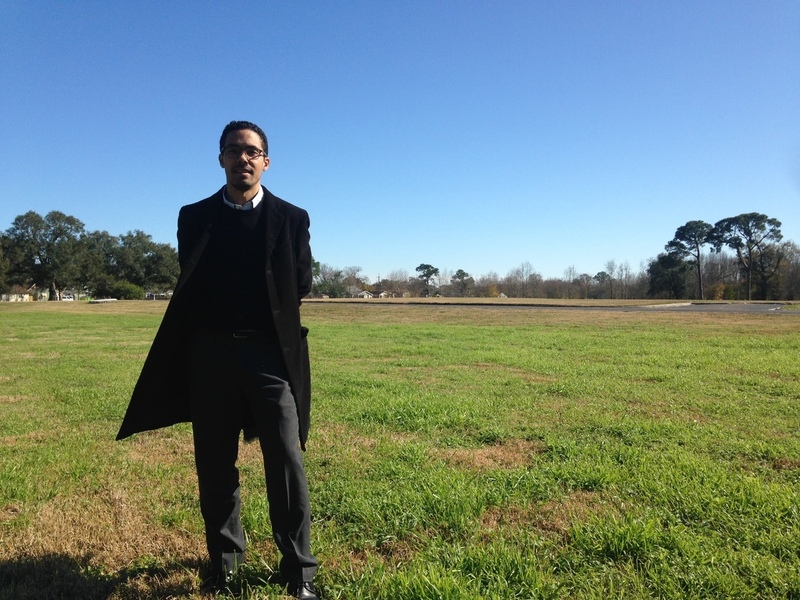 Jeff Hebert, who is leading New Orleans' efforts to adapt to rising sea levels, stands at the site of the future Mirabeau Water Garden, a federally funded project designed to absorb water in residential Gentilly. Coastal cities across the globe are looking for ways to protect themselves from sea level rise and extreme weather. In the U.S., there is no set funding stream to help — leaving each city to figure out solutions for itself. New Orleans and Philadelphia are two cities that face very similar challenges of flooding from rising tides. But they've chosen to pay for the solutions in very different ways. "One of the biggest challenges of the next several decades is going to be water — either too much of it or not enough," says Jeff Hebert, chief resilience officer in New Orleans. In New Orleans, the problem is too much water. Hebert's job is to help the city prepare for disasters like hurricanes and rising sea levels. "You see a lot of driveways that are buckling, the streets that are buckling, you see the foundations of these homes that are buckling," he says. But it won't look like this for long. In January, New Orleans won a $141 million grant from the U.S. Department of Housing and Urban Development to build a "Resilience District." It's an experiment with pervious surfaces and water-absorbing parks located in Gentilly, one of the worst-hit areas after Hurricane Katrina. It'll include water features in medians to reduce flooding, as well as lagoons and a pond. Hebert points to a spot where he says a large sports field "will be allowed to inundate under water when it rains. You'll see almost a creek that will go through here." The grant the city received is in addition to $2 billion in relief payments the city just received from FEMA for Katrina-related infrastructure damage. Robin Keegan, who works with GCR, a consulting firm, helped the city apply for some of those grants. She says after Katrina, the city faced some hard choices. "Every system that we had in place had to be looked at anew because everything was broken and we had to fix it," Keegan says. She says the reason it's getting federal and private money to come up with new ways to deal with water, is because it's already been hit again and again. "New Orleans is identified as a place that has gone through that thinking and is actually setting up the best practices and the models," Keegan says. But of course, not every city has the cachet — or the same level of crisis — that New Orleans has. In Philadelphia, those big checks from government and private entities aren't rolling in. On the one hand, the city isn't as vulnerable as New Orleans. But some of its neighborhoods are expected to flood from rising tides along the Delaware River. To pay for upgrades, the city has to turn to its residents, who pay a stormwater fee each month. For most it's only a few bucks, but for others it can be a handful. 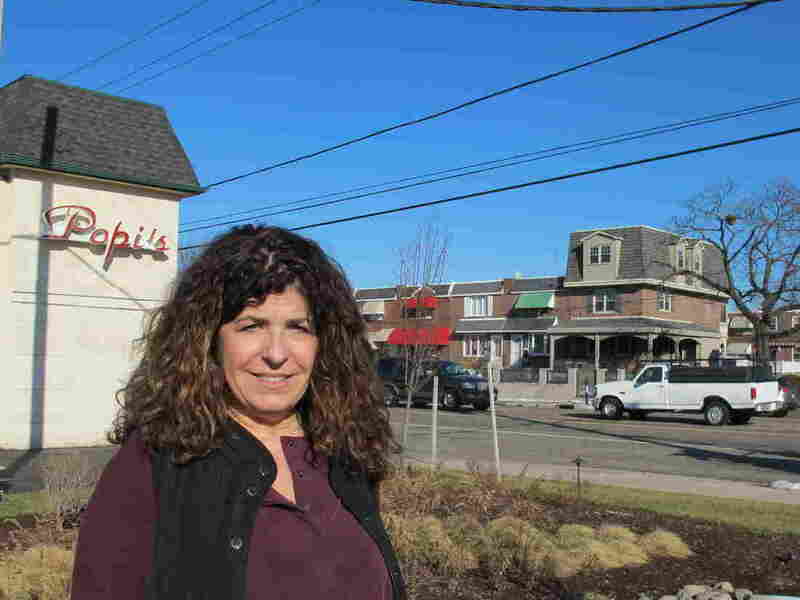 Gina Rucci operates Popi's, an Italian restaurant in South Philadelphia. Several years ago, she bought an adjacent property and turned it into a parking lot. Then she received a $330 bill. Gina Rucci stands by a new rain garden built in the parking lot of her restaurant in South Philadelphia. The improvements have cut her water runoff bill by 60 percent. "And I wasn't thinking about a water bill because there was no water on the lot," Rucci says. It was a bill from the city for the water run-off from her parking lot. To reduce that bill, she recently found out about a program where the city encourages "green infrastructure" — things like rain gardens, tree trenches and green roofs. 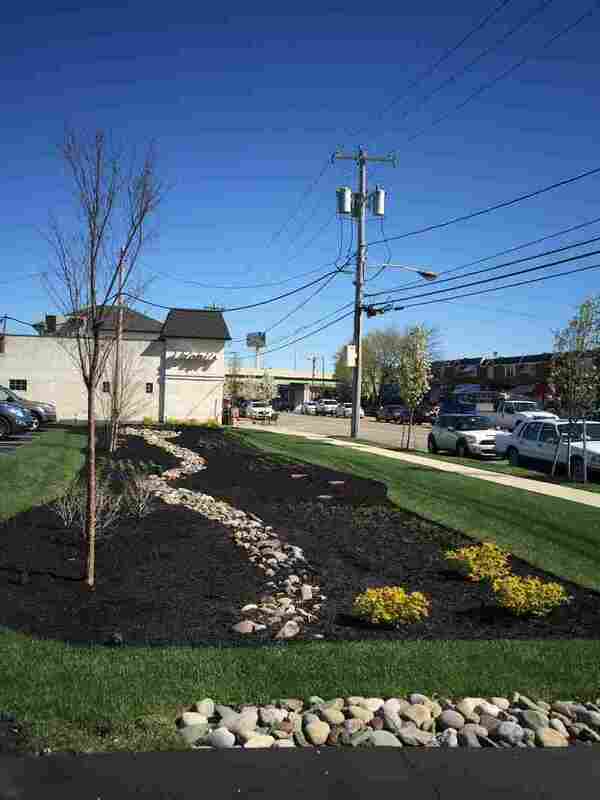 Poppi's Restaurant parking lot with the new rain garden that helps reduce runoff. "Once your own ground here becomes permeable, that water's not going that way; it's going to just sink," Rucci says. "And that's what you need it to do." Today, she has cut her water runoff bill by 60 percent. So far Philadelphia has built hundreds of green infrastructure projects in streets, parks and parking lots. Chris Crockett, an engineer with Philadelphia's water department, is in charge of planning for climate change. "Instead of doing these greener practices, we could just go and dig a hole to China and build a tunnel, but that has a huge carbon footprint," Crockett says. And green infrastructure is cheaper — especially compared to more traditional engineering approaches like building a large concrete tunnel to hold the extra water. That hole-and-tunnel approach would have cost the city's ratepayers $10 billion and taken decades to complete. The thousands of rain gardens, green roofs, and tree trenches will cost the city around $2 billion. Tegan Wendland is a reporter at member station WWNO and Susan Phillips is a reporter at member station WHYY.